About YLM Products : Tube Benders : J&S Machine, Inc.
YING LIN Machine Industrial Co., Ltd. founded in 1976, is a leading and well recognized manufacturer specializing in CNC, NC & conventional type tube & pipe bending machinery. YLM has earned an excellent reputation in both the domestic & international markets in the past 29 years. YLM has qualified to obtain the ISO 9001:2000 certificate & CE MARK verified by European organizations. Netherlands. With the years of experiences in selling more than 18,000 sets of tube benders by 2003, YLM can meet every aspect of the market requirements. YLM’s R & D engineers modify the machines for special requests from our clients while the service engineers and support personnel offer immediate after sales service. 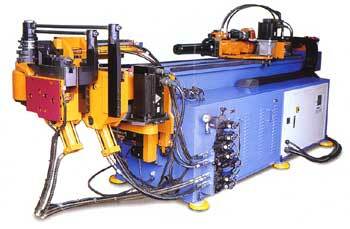 YLM’s CNC PC Based tube bender was the first PC Based controlled system in Asia developed in 1991. The R&D division engineers not only develop the software to meet the global customer different requirements, but also continuously revise and upgrade the existing software to be more efficient and user friendly. YLM’s consistent company goal is to provide tube benders that the clients can operate easily to maximize their profits and return on investment. YLM always believes that the "Customer's business is YLM Business." YLM provides 24 hour nonstop after sales service to all customers in the world. You are not only buying the machine from YLM, you are buying tube-bending technology and tooling know-how as well.